JSP Page Context Object is used to store and retrieve the page-related information and sharing objects. PageContext is an instance of javax.servlet.jsp.PageContext. PageContext is used to findAttribute, setAttribute, getAttribute and removeAttribute and it has the following scope. findAttribute(String AttributeName): This method is used to search the attributes like the page, session, request, application. Return type is an object. If there is no attribute it returns null. getAttribute(String AttributeName, int scope):This method is used to get the attribute with specified scope. This is same as findAttribute() method but getAttribute look for specific scope. It returns the object, if there is no attribute, it returns null. removeAttribute(String AttributeName, int scope):This method is used to remove the attribute from given scope and there is no return type of this method. setAttribute(String AttributeName, Object AttributeValue, int scope):This method is used to set the name of the attribute, attribute value and scope of that object. This method has no return type. Following is an example to JSP Page Context Object. Here the developer just created two text boxes such as Name and FullName and also created submit button. request.getParameter() method is used to retrieve the details which are placed in HTML page. pageContext.setAttribute() method is used to set the name of the attribute, attribute value and scope of that object. This method has no return type. getAttribute(String AttributeName, int scope) method is used to get the attribute with specified scope. Output will be as follows with two text fields and one submit button. After enter the text field names, it displays Hello followed by name then click on button that click here. The final output will be as follows. 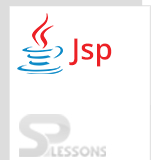 JSP Page Context Object is used to set, get and remove attributes from the scope. JSP Page Context Object – Page scope is the default scope.